INDUSTRY.co.id - Jakarta - PT Pertamina (Persero) has been alerting BBM packaging to face the Lebaran 20117 homecoming flow at the point of potential traffic jam in solid route. Commercial Retail Fuel Marketing Pertamina Manager Deny Djukardi explained Pertamina has prepared various needs of mudik service besides fuel supply. "The services include post breaks travelers, Kiosk providers of fuel and direct distribution of fuel packaging for the travelers," said Deny at Pertamina Headquarters, Jakarta, Thursday (31/05/2018). PT Pertamina (Persero) alerted 60 points of packaging kiosks or Kiosk Pertamax kiosks spread across Java and Sumatra, to meet consumer demand during Lebaran 2018. Previously, Retail Fuel Marketing Rayon 4 Pertamina Residency Pekalongan, Fachrizal Imaduddin, said that based on last year's experience one kiosk of fuel can serve consumers up to 168 thousand liters Pertamax every day, while the gas station only serve a maximum of 60 thousand liters per day. "This means consumers are moving from gas stations to kiosks," Fachrizal told reporters when introducing Kiosk Pertamax at Muri gas station, Pantura Tegal line, Central Java. KiosK Pertamax became one of the alternatives for travelers to get fuel other than at the pump. KiosK Pertamax will operate from H-15 Eid Fitr 2018, by providing Pertamax type fuel for gasoline and Pertamina Dex for diesel fuel. Vice President Corporate Communications of PT Pertamina (Persero) Adiatma Sardjito in a written statement said the dissemination of Kiosk Pertamax more on the island of Java, as the concentration of travelers nationwide. The number is divided in West Java region by 23 points, Central Java and Yogyakarta 25 points, and East Java 10 points. For West Java, Kiosk Pertamax is available on toll roads and non-toll roads, namely in Bekasi, Karawang, Cikampek, Dawuan, non-toll lanes to Tasikmalaya, and the Cirebon-Brebes border. In Central Java, KiosK Pertamax is located in Brebes, Tegal, Pemalang, Batang, Kendal, Ungaran, Salatiga, and Sragen Functional Toll Road. In East Java the number of Kiosk Pertamax is relatively small compared to West Java and Central Java, as the number of homecomers has begun to decrease. KiosK Pertamax can be found in Ngawi, Madiun, Wilangan, Kertosono, Mojokerto and Gempol-Pasuruan lanes. In addition to being sold using mobile dispensers directly connected to the "storage car" SPBU gasoline capacity of 8000 liters, BBM is also provided in packs of jerry cans or 10 liters capacity, which will be distributed by motorists BBM to road users in the event of congestion. In each kiosk will be alerted two "car storage" fuel pump to ensure the availability of supplies. 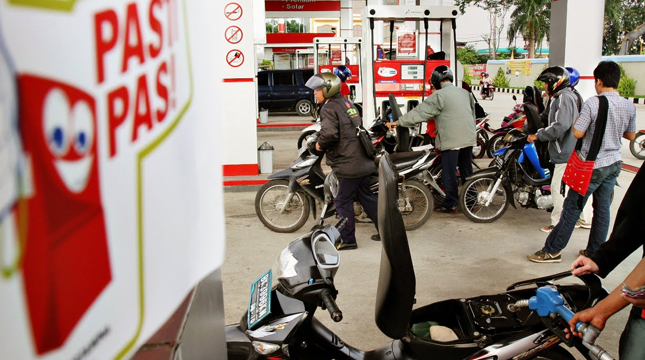 The selling price of gasoline at kiosks is the same as those sold at gas stations, which are Rp8,900 per liter for Pertamax in West Java, Central Java and East Java. Pertamina Dex is sold at Rp10,000 per liter in West Java and Rp10,100 per liter in Central Java and East Java.